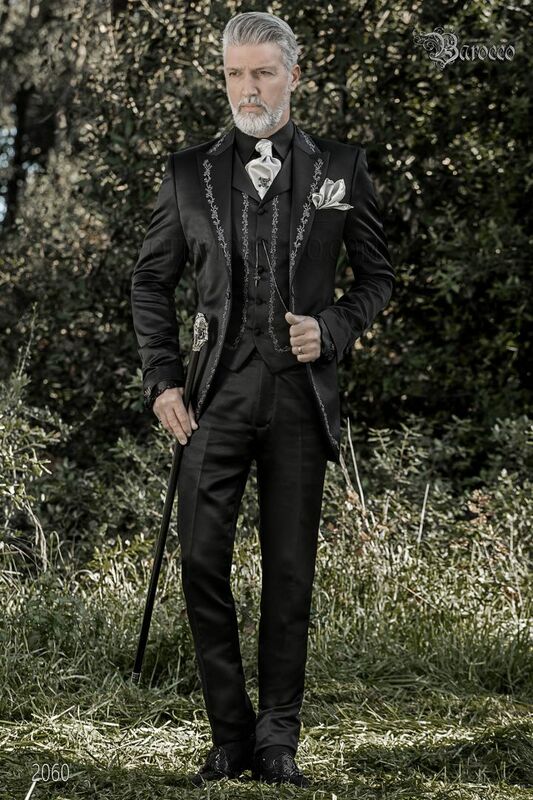 Black satin short-tailed groom suit with smoky grey embroidery Peak lapel with single patterned button closure. Flap poc... Black satin short-tailed groom suit with smoky grey embroidery Peak lapel with single patterned button closure. Flap pockets, angled buttonholes and trims. Single patterned button for each sleeve and single vent at back. Length of jacket is typically suitable from the groom. Waistcoat made from black satin with silver-tone embroidery. Shirt made from black satin with standard collar. Ruffles along the placket and cuffs. Exposed placket with black diama... Shirt made from black satin with standard collar. Ruffles along the placket and cuffs. Exposed placket with black diamante embellished buttons. Convertible cuffs with black diamante embellished button. Cravat and handkerchief set made from pearl grey satin. Handmade. Black coated beechwood cane with nickel-tone skull knob with clear diamante embellishment. Tie pin with black skull with bones and crystals. Protective cap included. Gunmetal grey chain with sword pendant and smoky grey diamante embellishment. Gunmetal grey ring with skull design and smoky grey rhinestones. Nickel free.